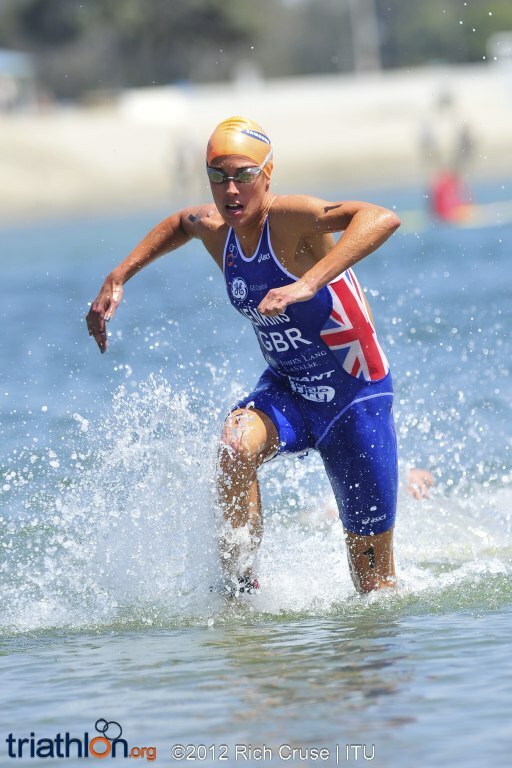 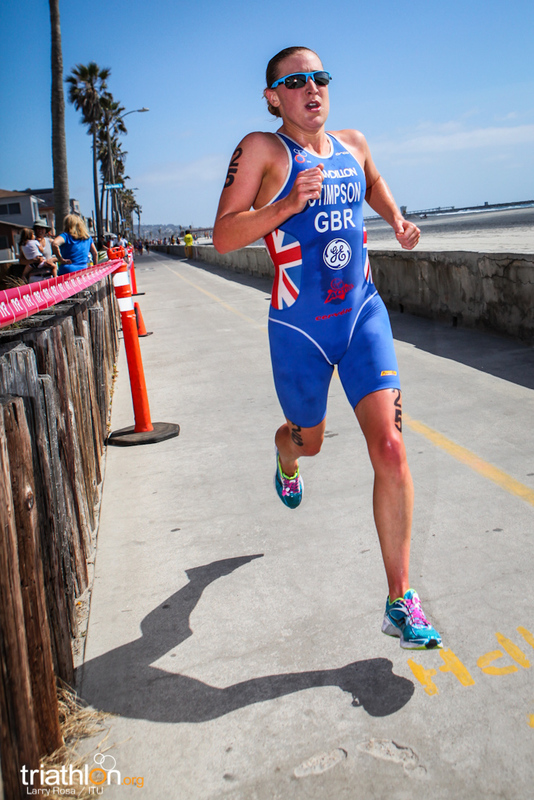 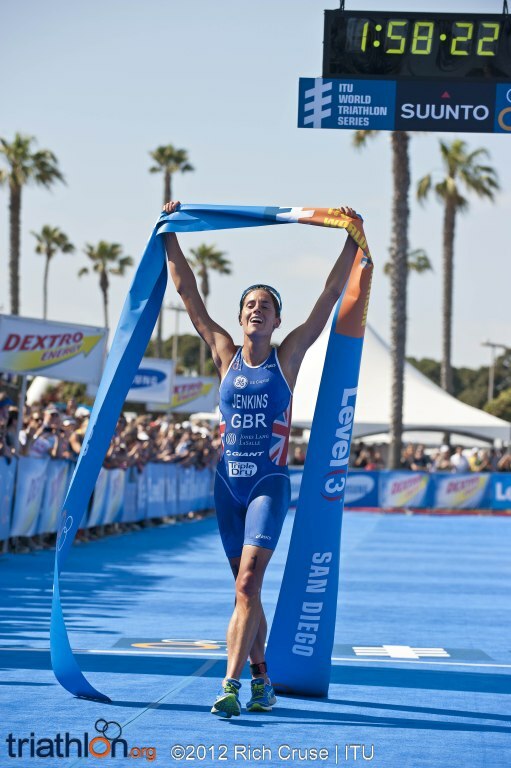 Great Britain’s Helen Jenkins continued her brilliant start to 2012 with a dominating run to crush the field in San Diego, in a race that had a huge impact on London Olympic qualification. 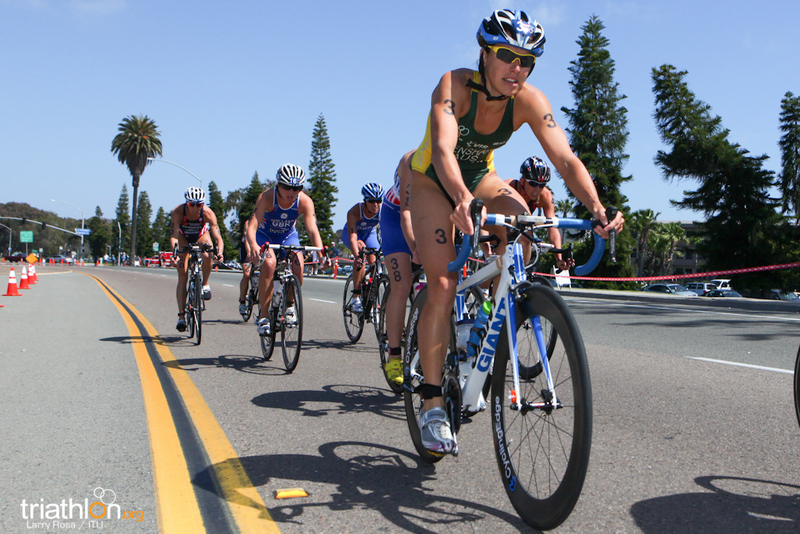 After an eight-women bike breakaway put 2 minutes and 30 seconds on the first chase group coming out of T2, Jenkins and Australia’s Erin Densham went to the lead into the first lap of the 10km run. 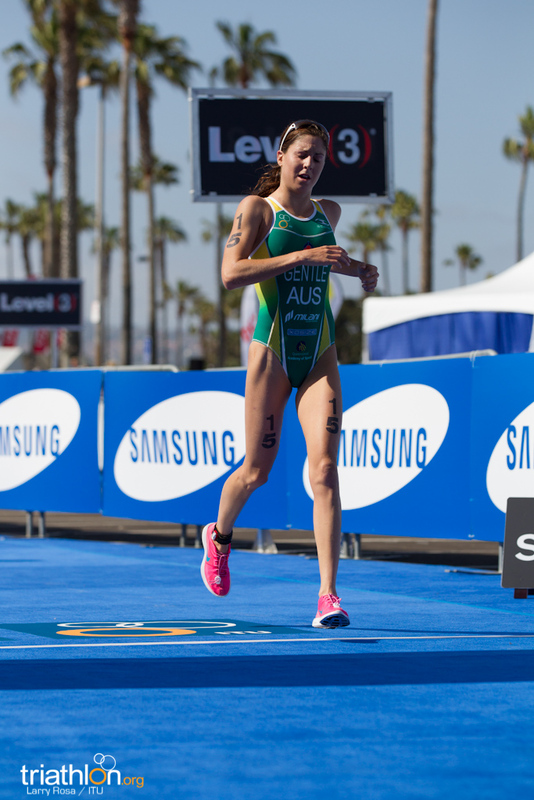 In see-sawing battle between the Australian Olympic hopeful and Jenkins, Densham pulled away to almost 10 metres in front in second lap before Jenkins stunningly reeled in the difference and turned the tables. 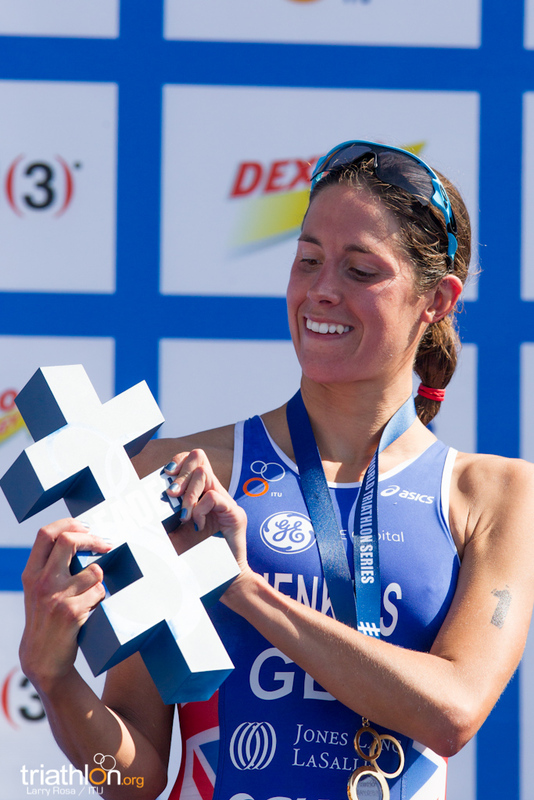 In an incredible second half, she went ahead to record a time of 1 hour 58 minutes and 21 seconds, over a minute ahead of Densham’s time of 1:59:26. 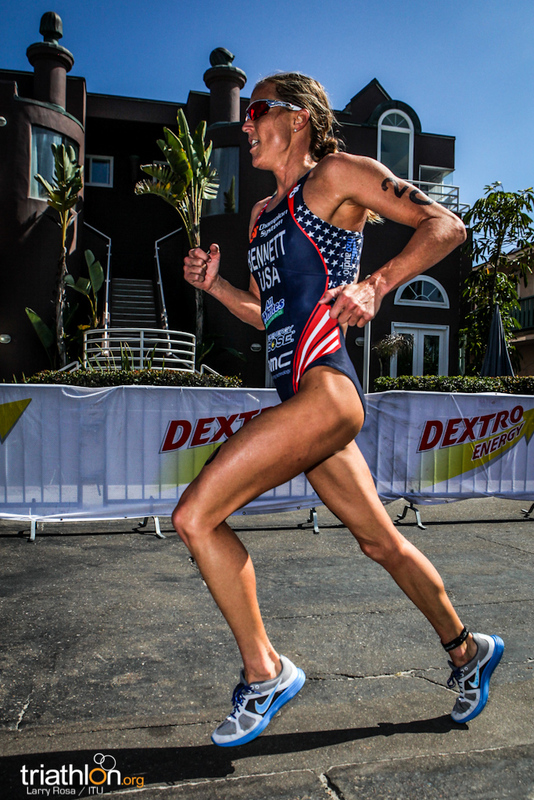 The USA’s Laura Bennett claimed third, her first series podium, and with it her second consecutive Olympic Games berth. 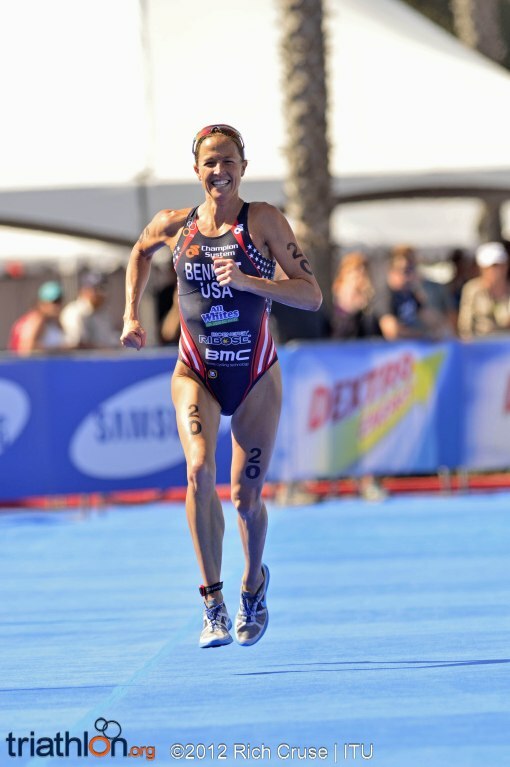 Jenkins said it had been hard, but the support on the run had helped her through. 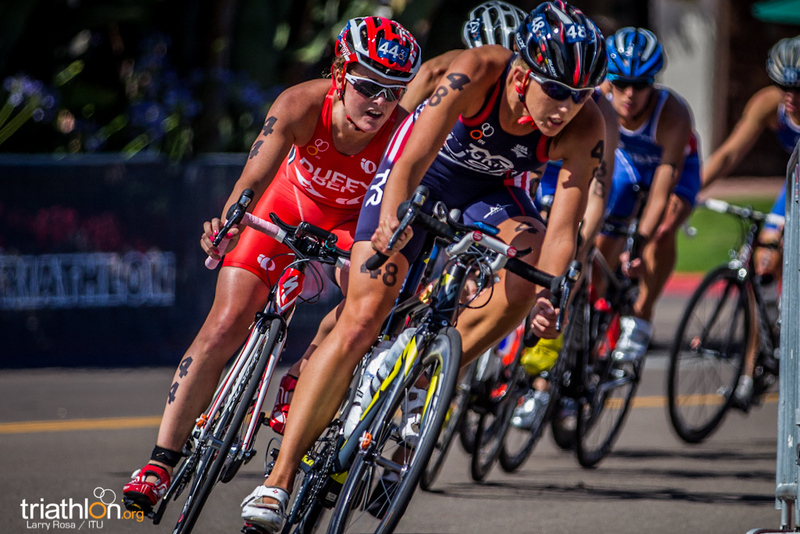 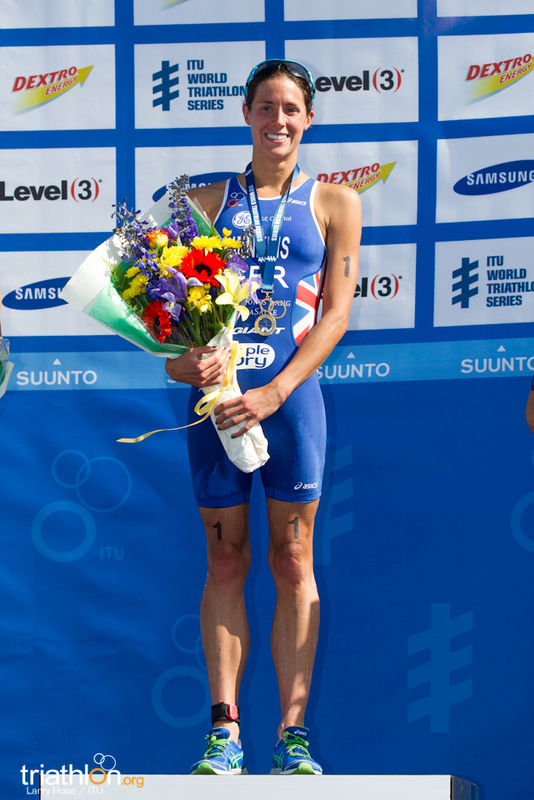 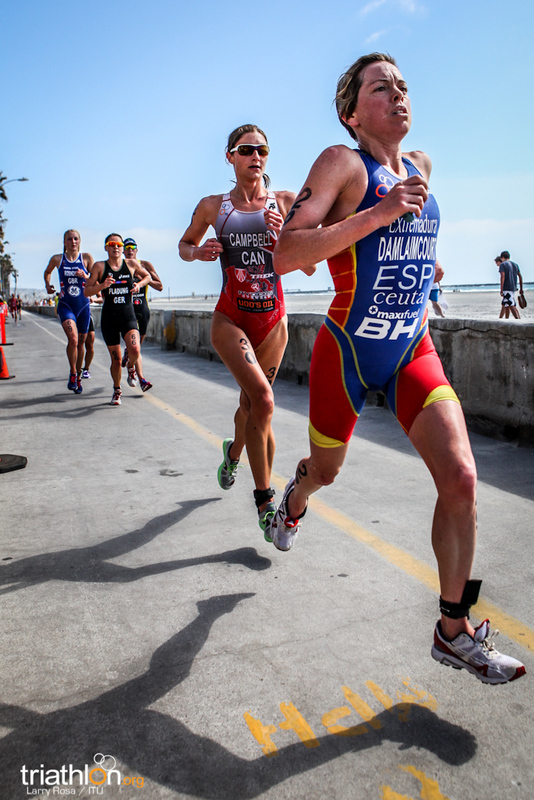 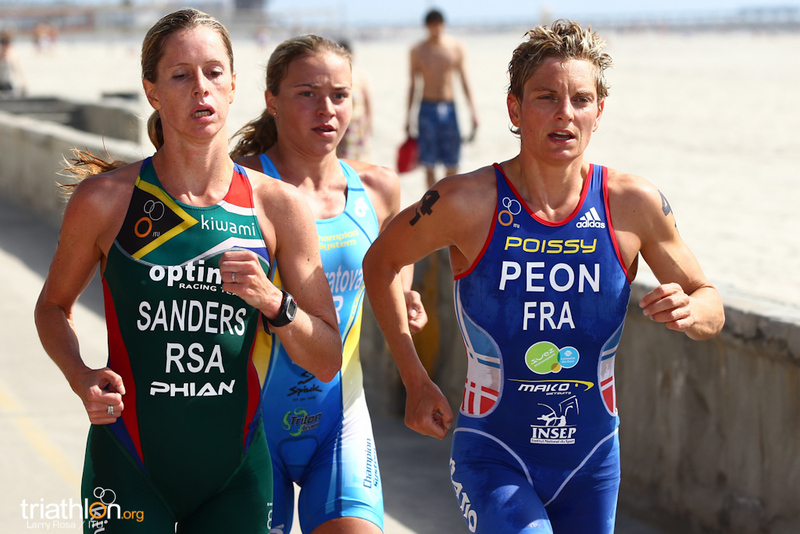 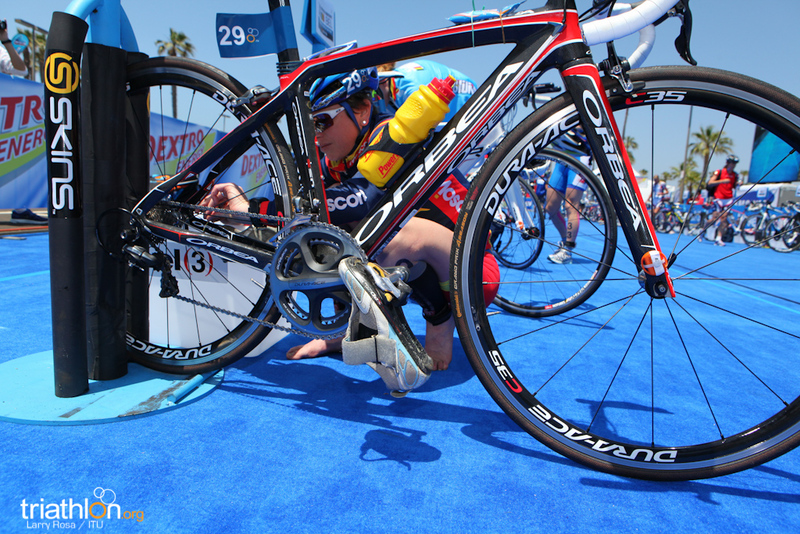 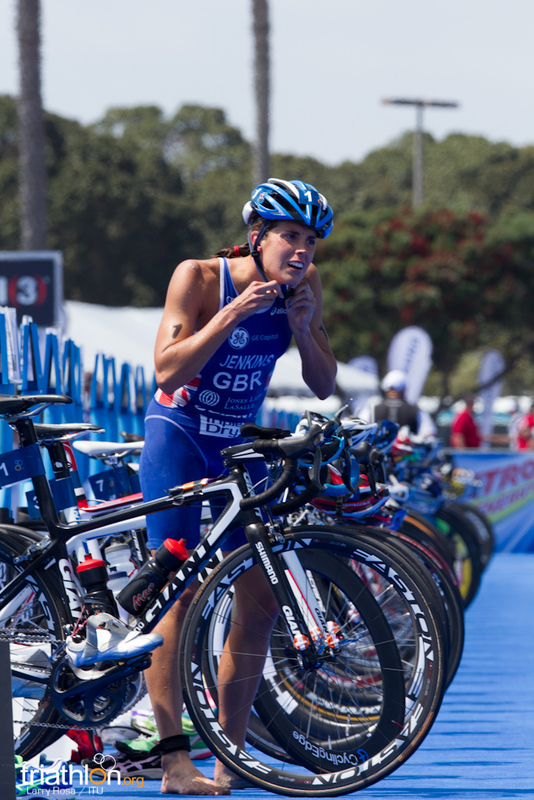 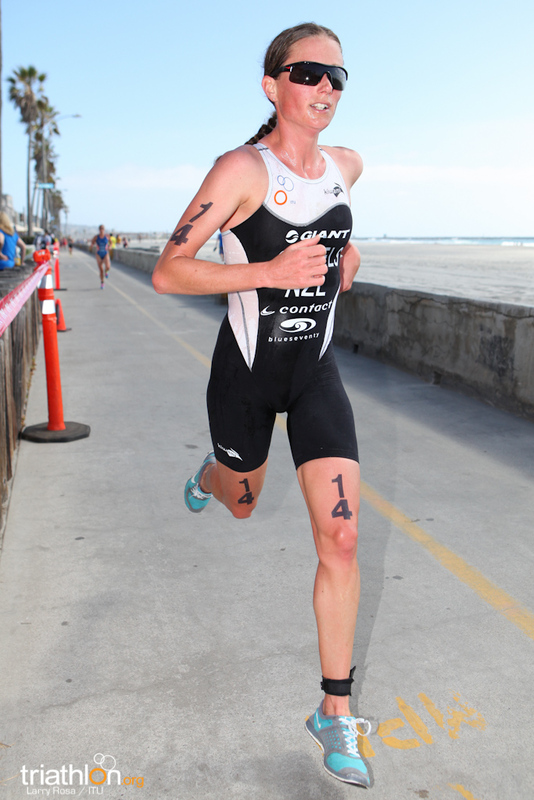 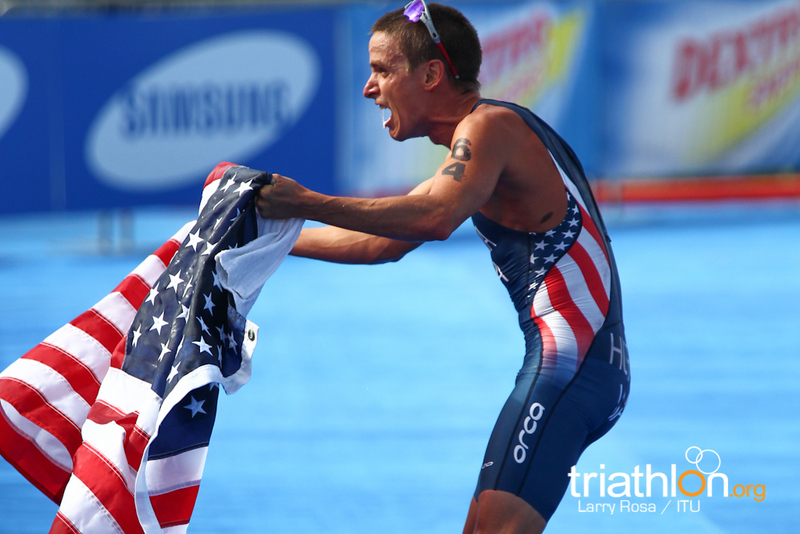 Densham’s third consecutive major podium for 2012 was a huge boost for her own Olympic selection hopes. 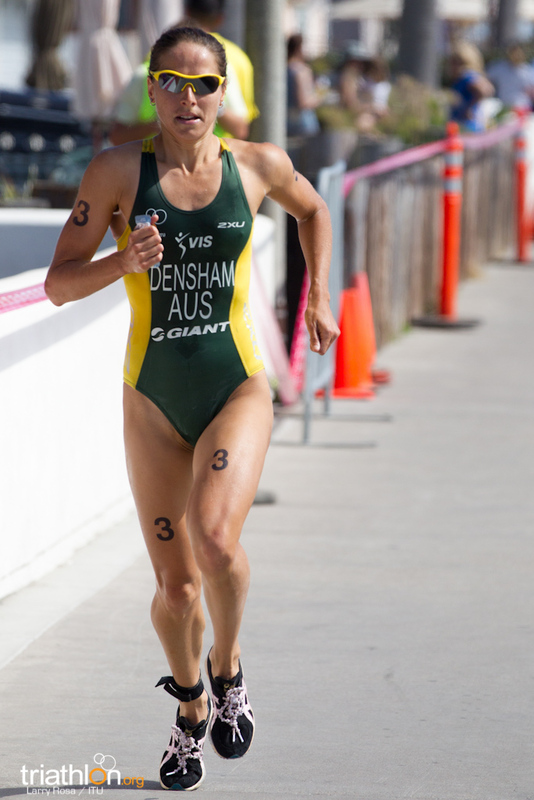 Densham was the first Australian, with Emma Moffatt finishing ninth, Ashleigh Gentle 10th, Emma Jackson 14th and Emma Snowsill 17th. 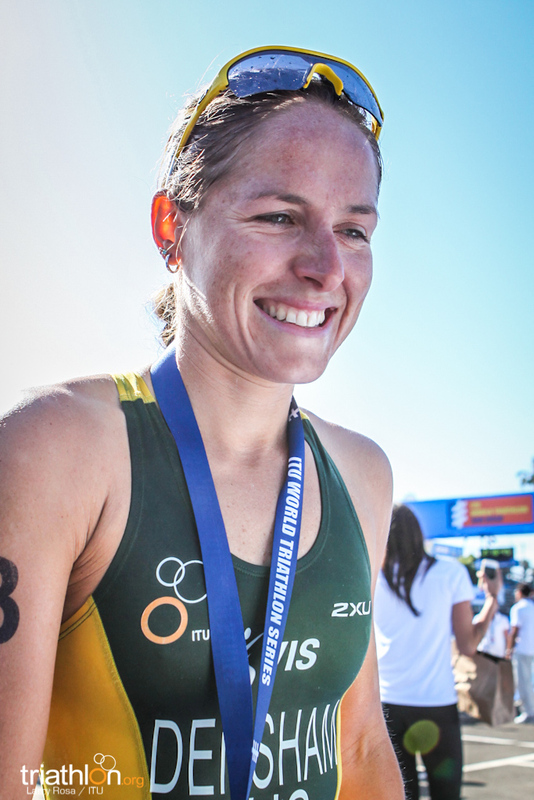 So far, only Moffatt has been named in the Australian team for London. 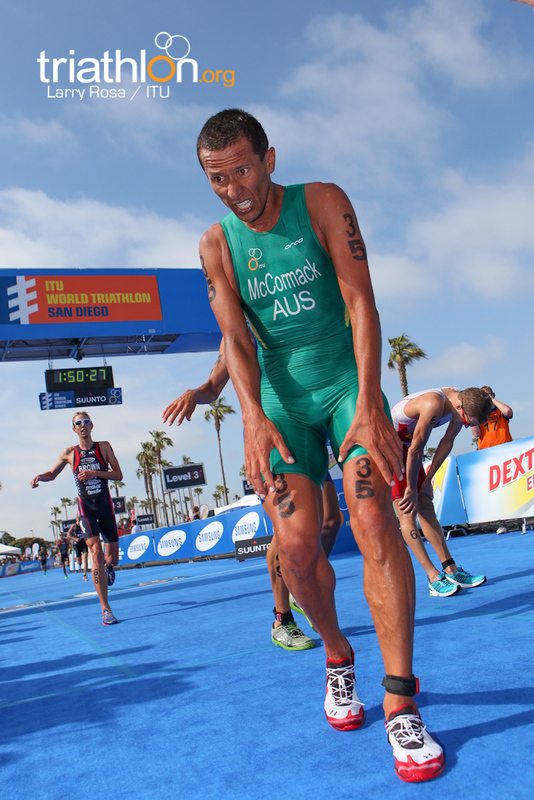 “I was hurting out there, I just hope I’ve done enough. 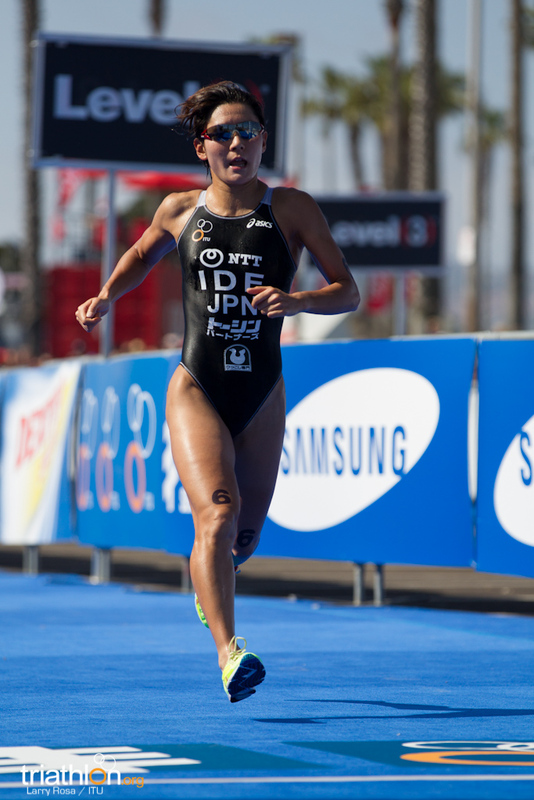 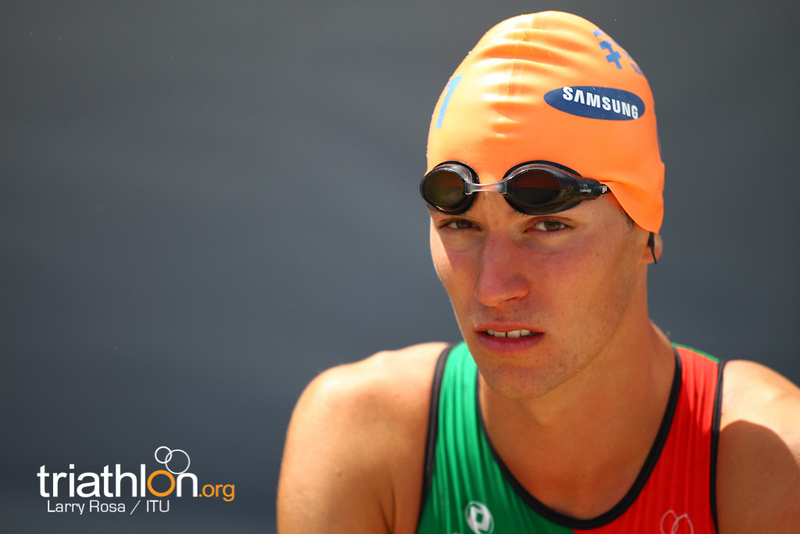 Ideally I would have taken a break after Sydney and not raced here, but I’ve had to push through and I really do hope that’s enough,” Densham said. 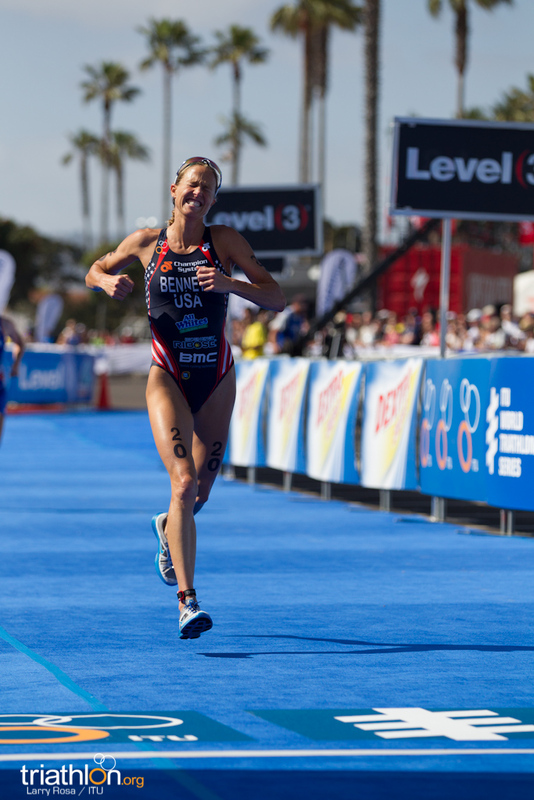 In the nail biting race for the third USA women’s spot, Bennett chose the perfect time to record her first series podium. 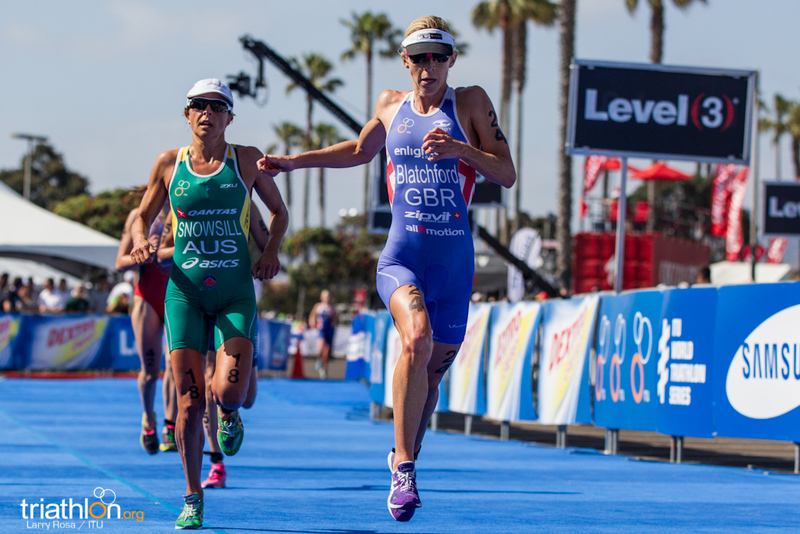 Given that Gwen Jorgensen and Sarah Groff both qualified their places in London last year, the battle for the third women’s spot was expected to come down to Bennett and another Beijing Olympian Sarah Haskins. 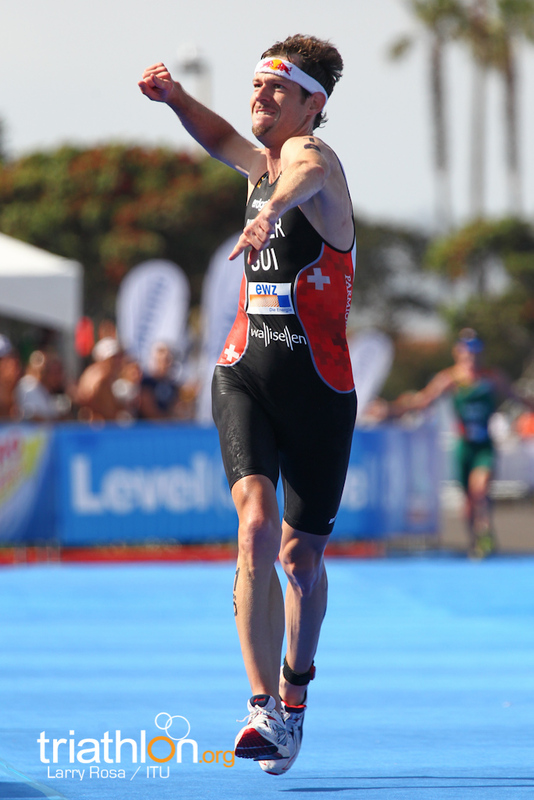 It turned out to be exactly that, as both were in metres of each other for almost the entire race. 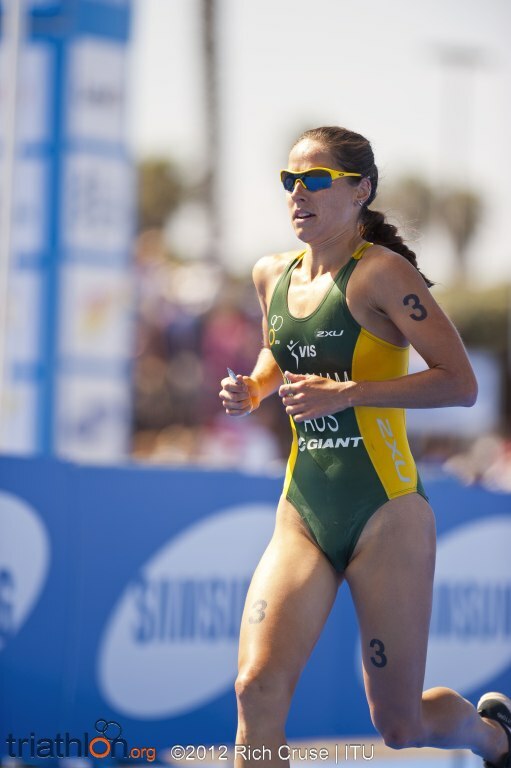 It was only in the final lap of the run that Bennett knew she had claimed her second consecutive Olympic Games spot, after she finished fourth at the 2008 Beijing Olympic Games. 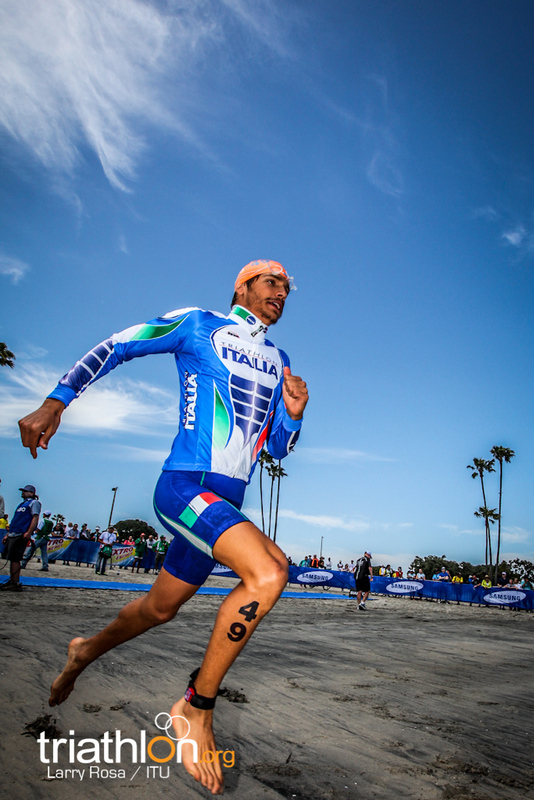 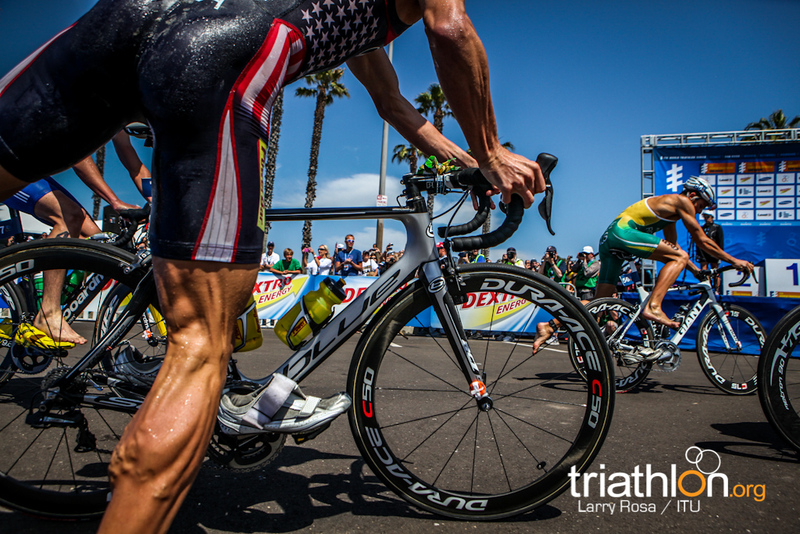 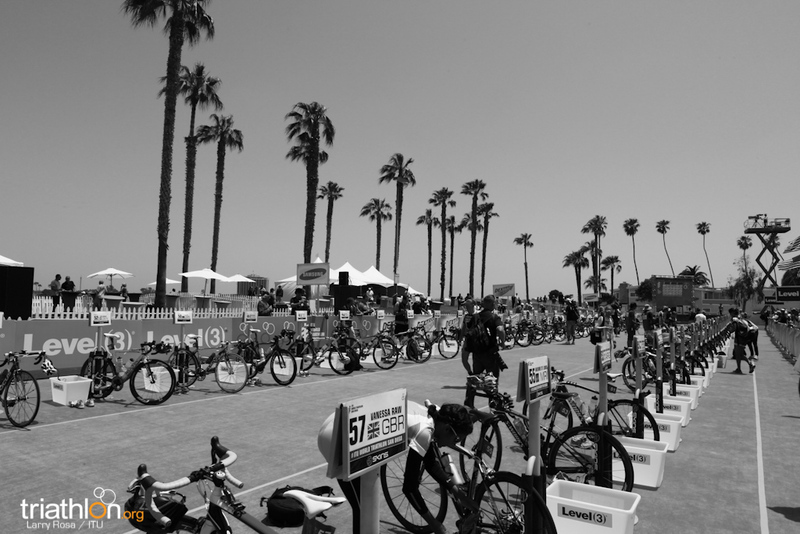 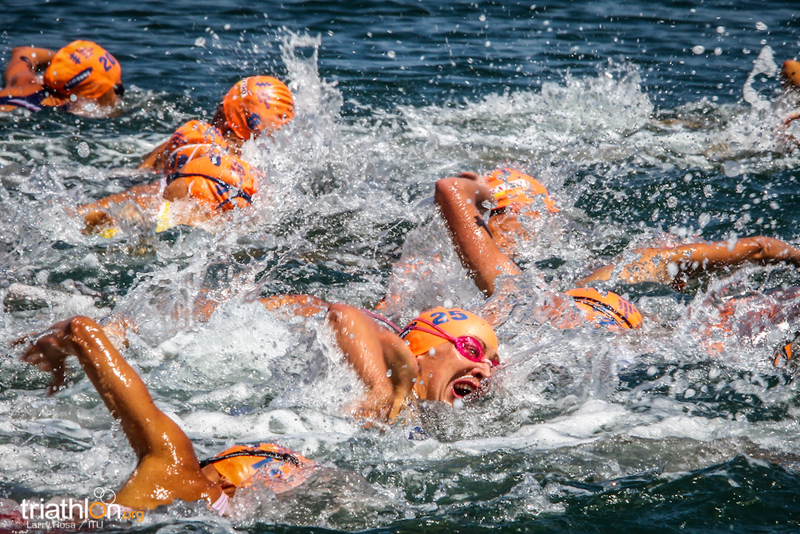 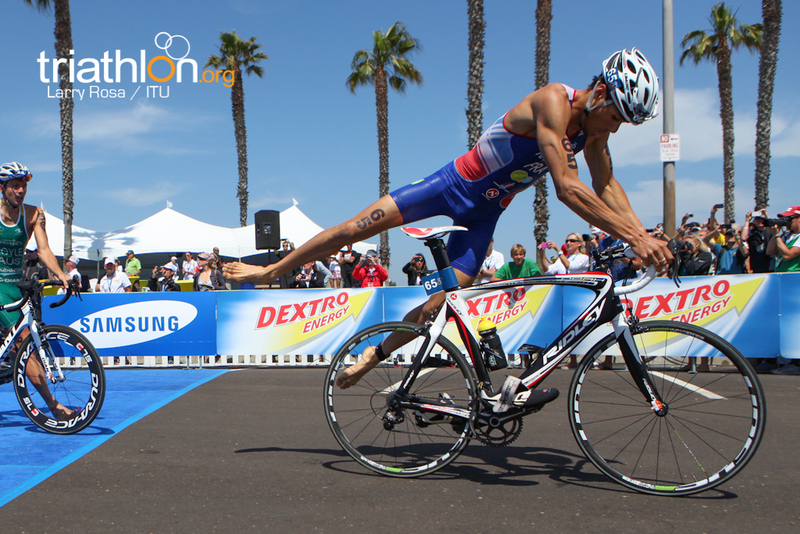 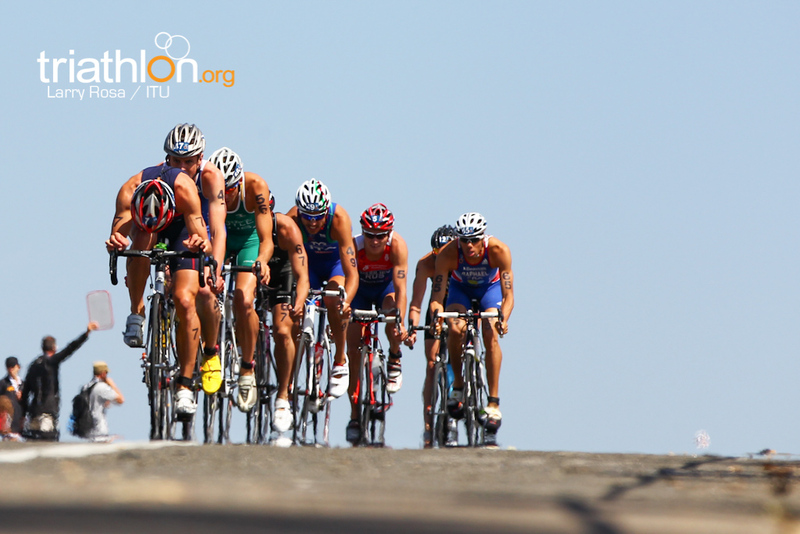 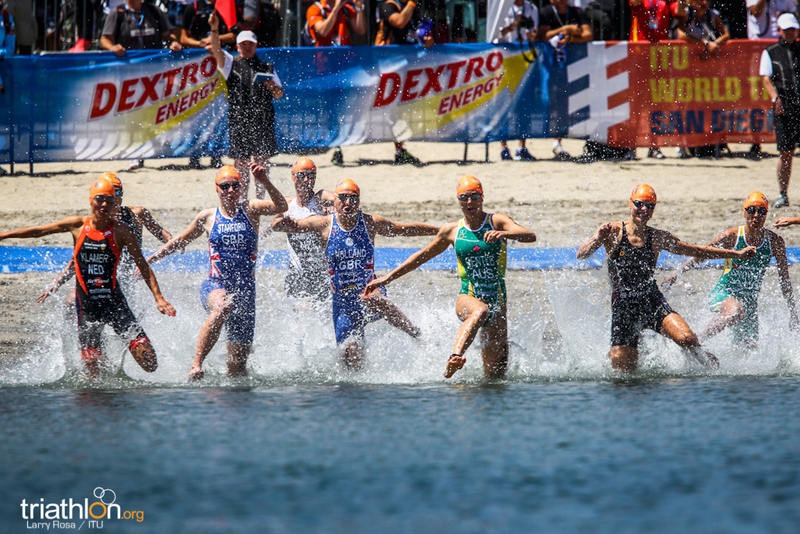 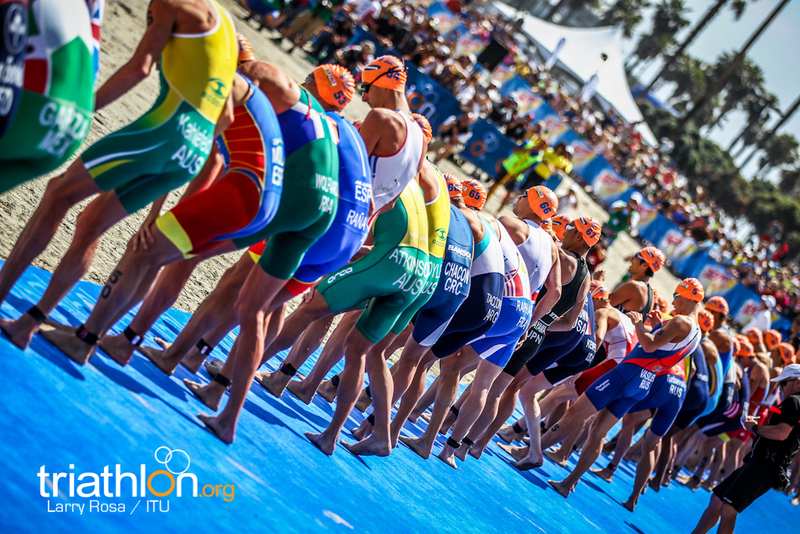 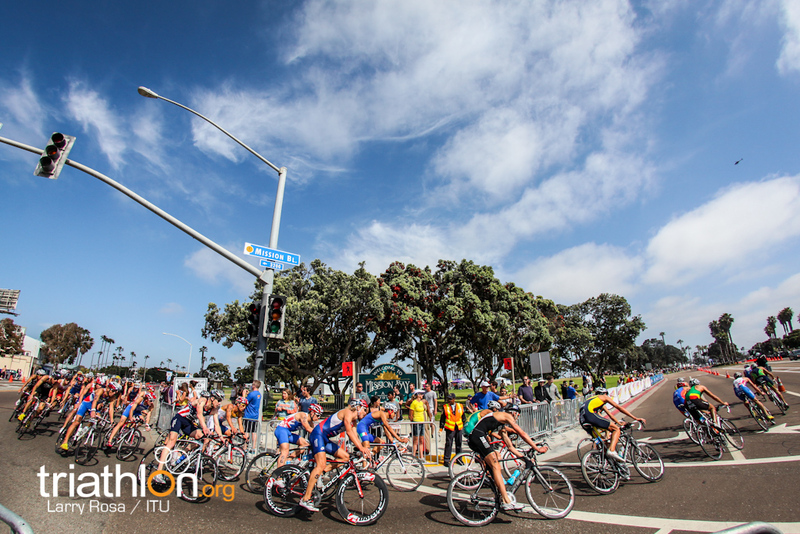 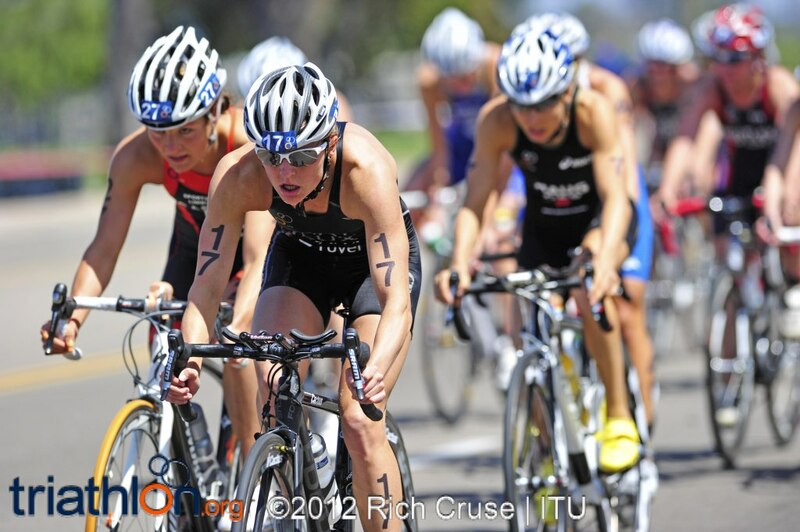 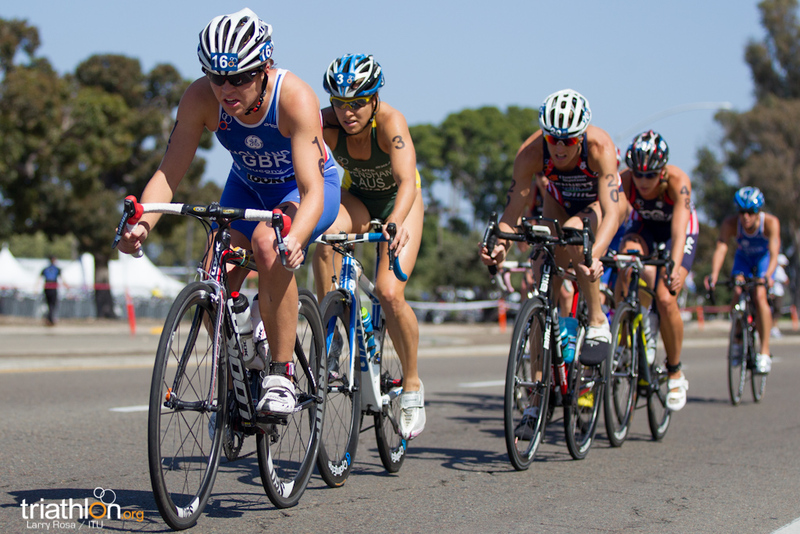 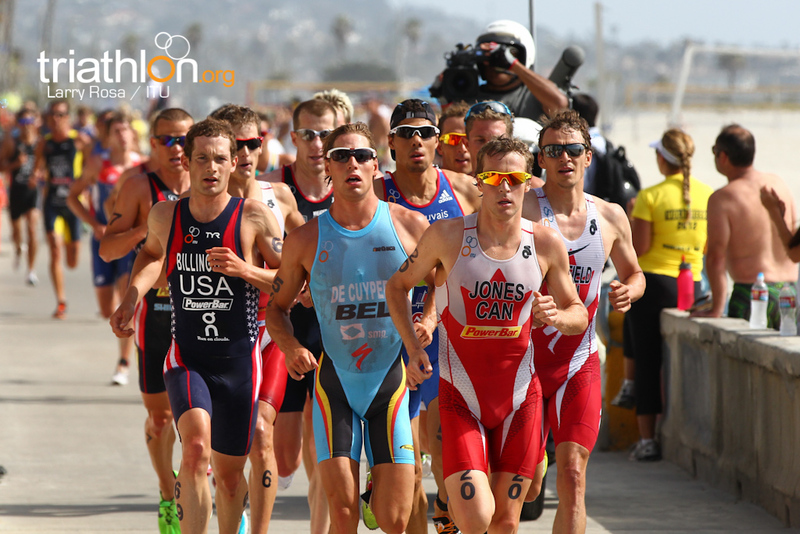 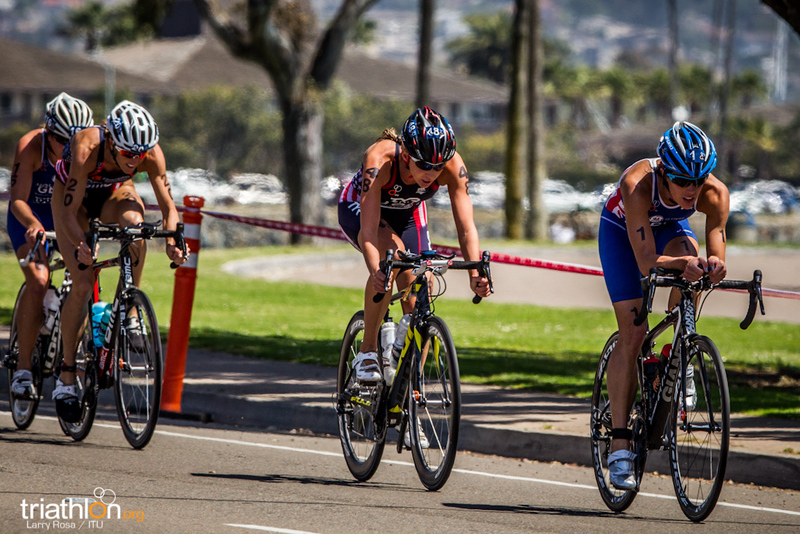 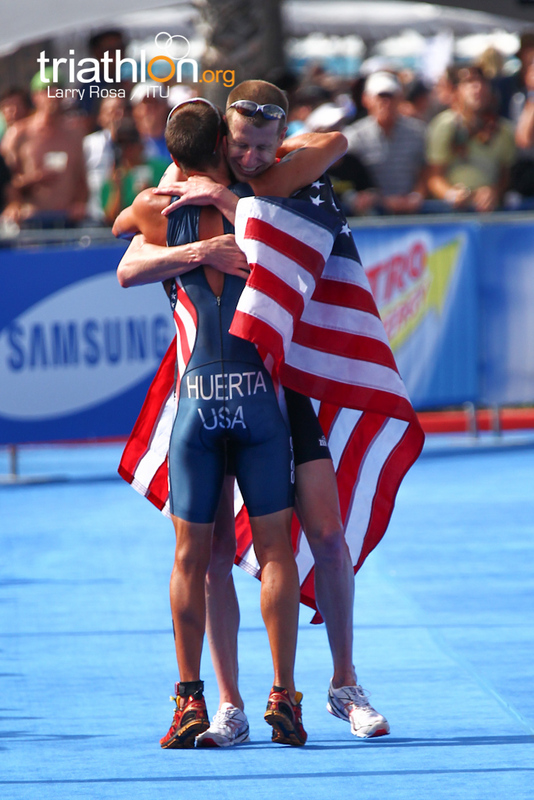 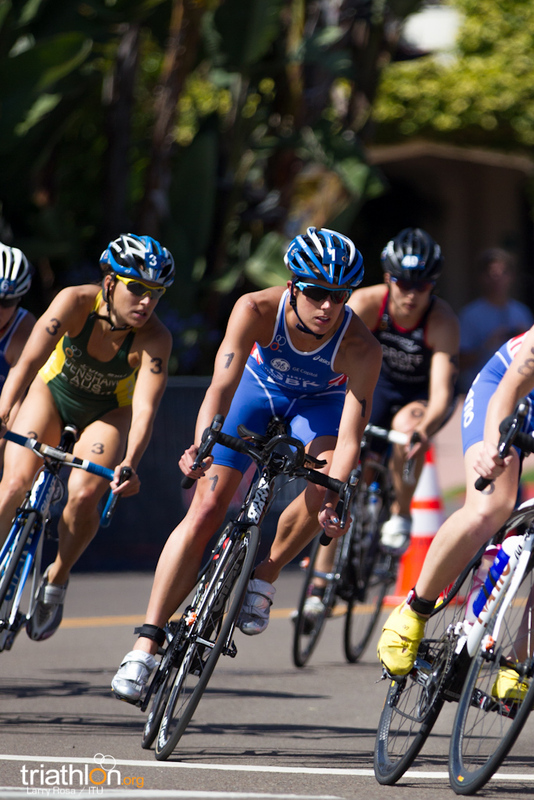 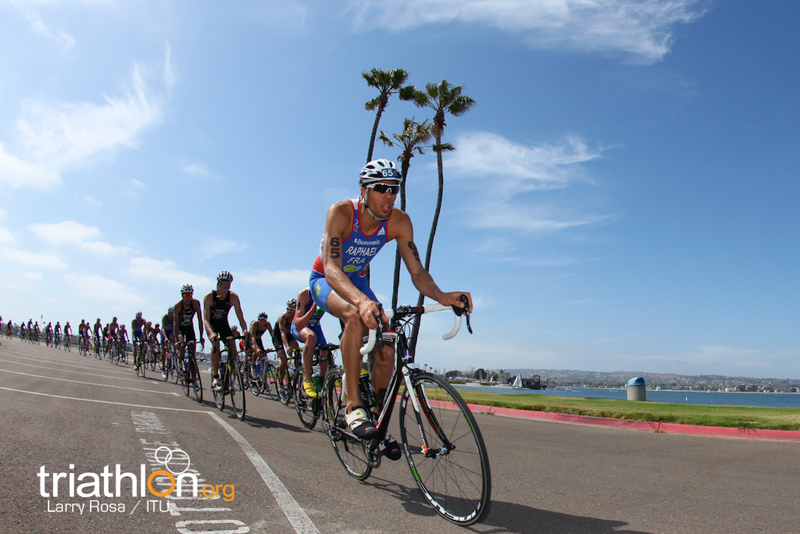 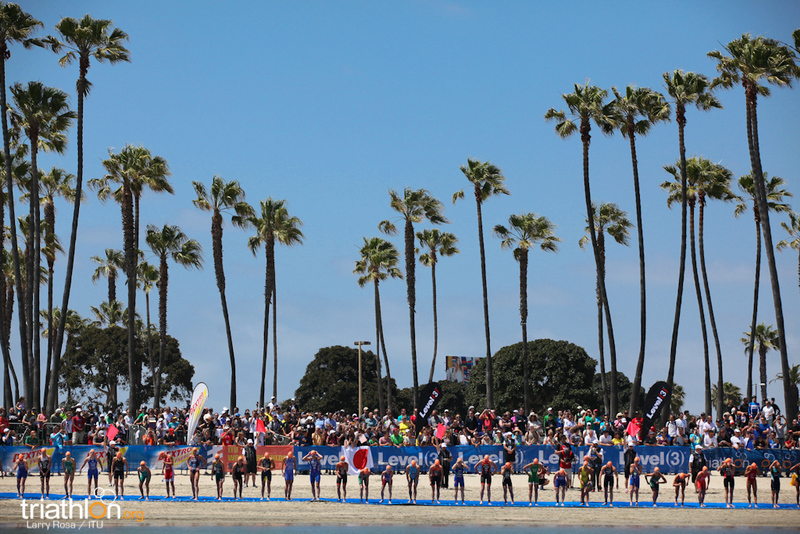 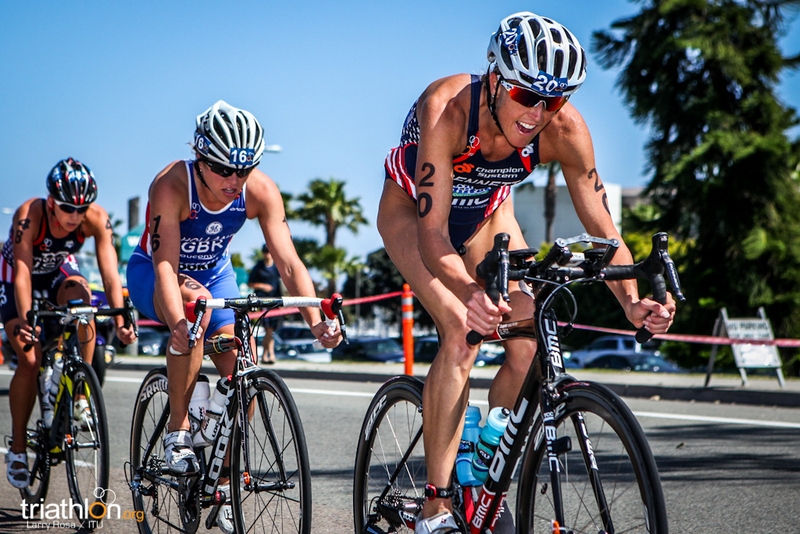 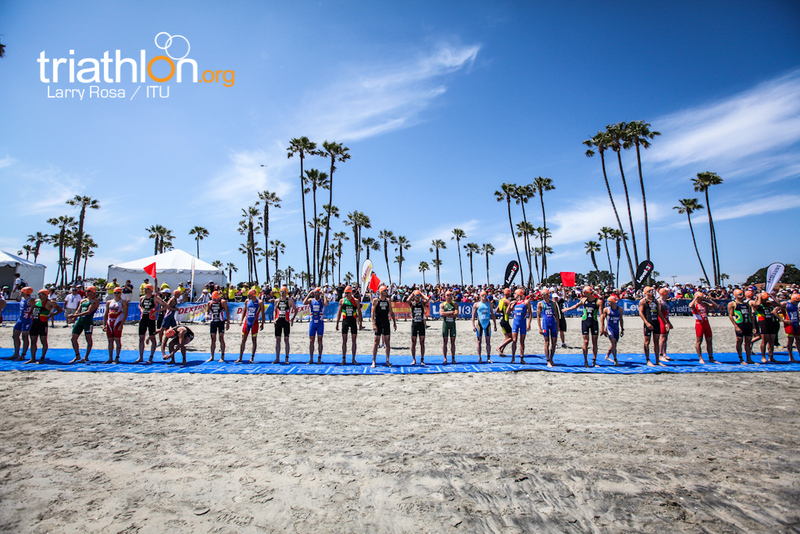 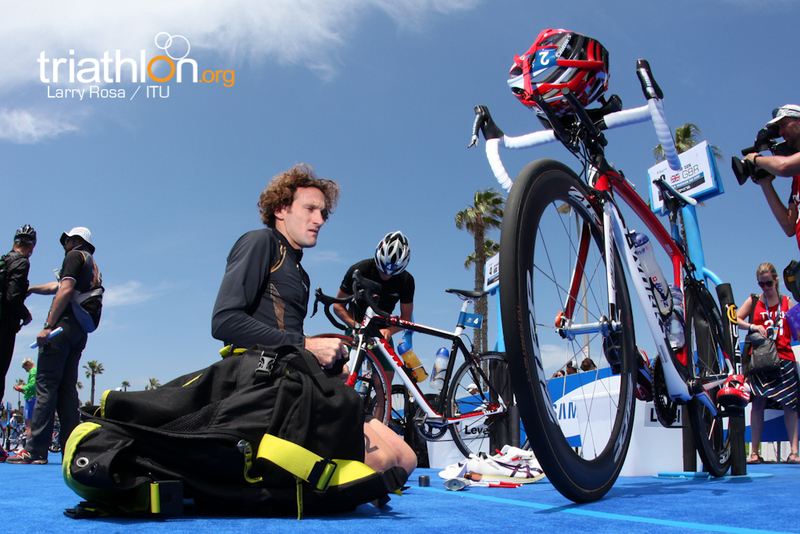 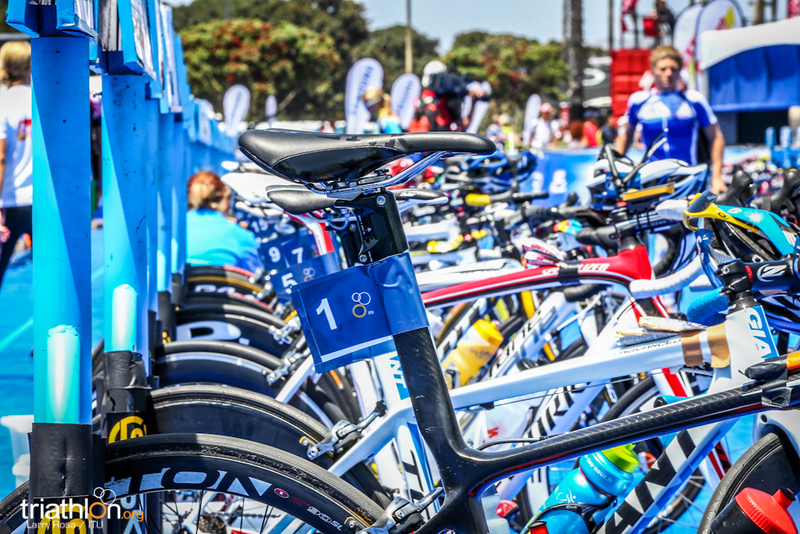 The first ITU race in San Diego, the original birthplace of modern triathlon started under a clear blue sky. 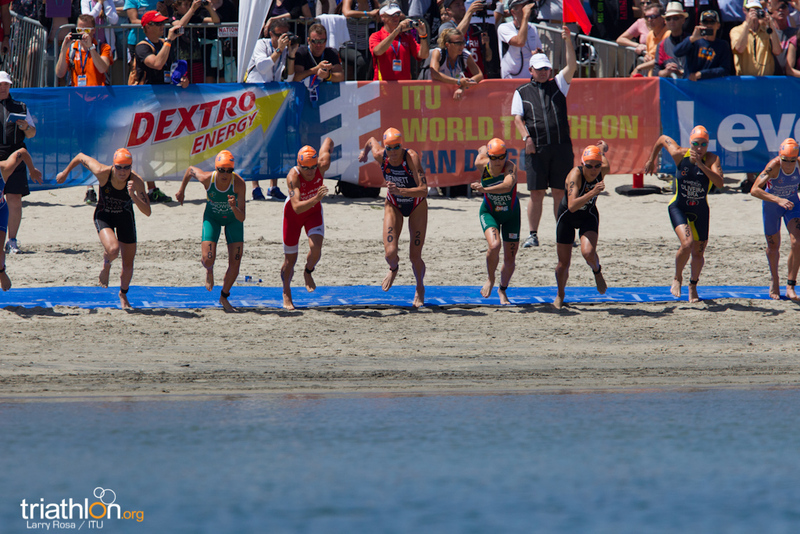 Jenkins, Densham, Bennett, Haskins, Vicky Holland, Sarah Groff, Flora Duffy and Jessica Harrison exited the swim first. 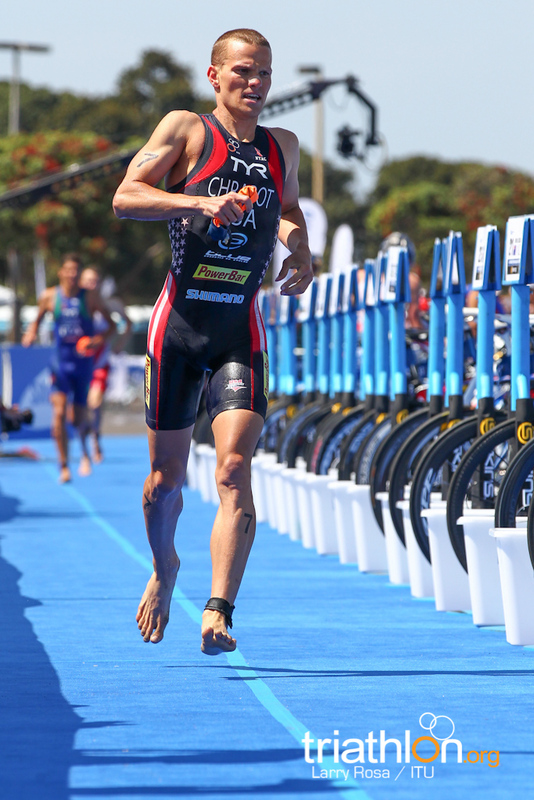 While they had a lead of almost 30 seconds on the rest of the field leaving T1, they worked quickly to extend that to almost a minute at the end of the first lap. 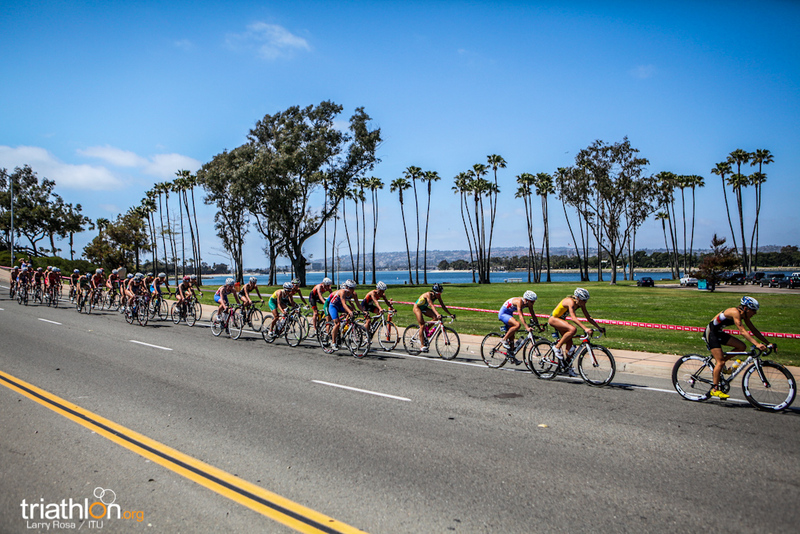 Taking turns at the front to drive the pace, that lead group extended the gap at every one of the eight laps of the bike. 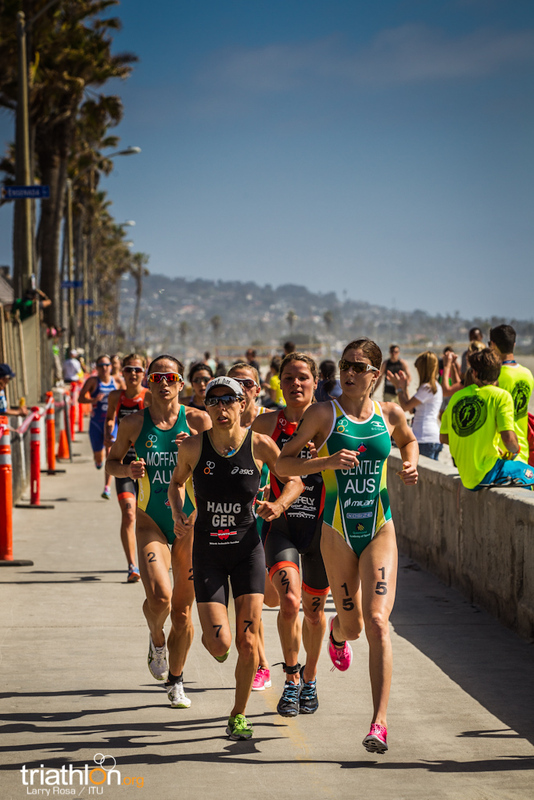 Behind them two distinct chase packs came together halfway through to make one main chase of 30 women that included Moffatt, Snowsill, Emma Jackson, Gentle, Liz Blatchford, and Anne Haug. 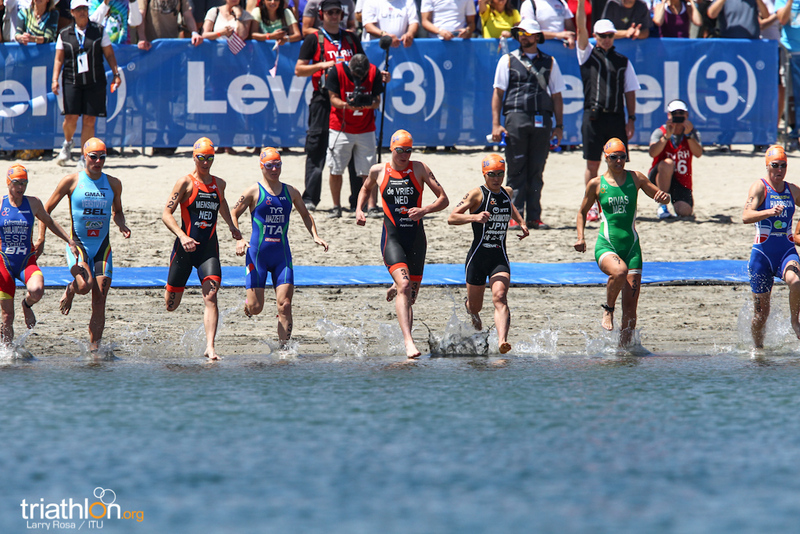 A third chase pack then formed about two minutes behind the first, which included Gwen Jorgensen, Daniela Ryf and Carole Peon. 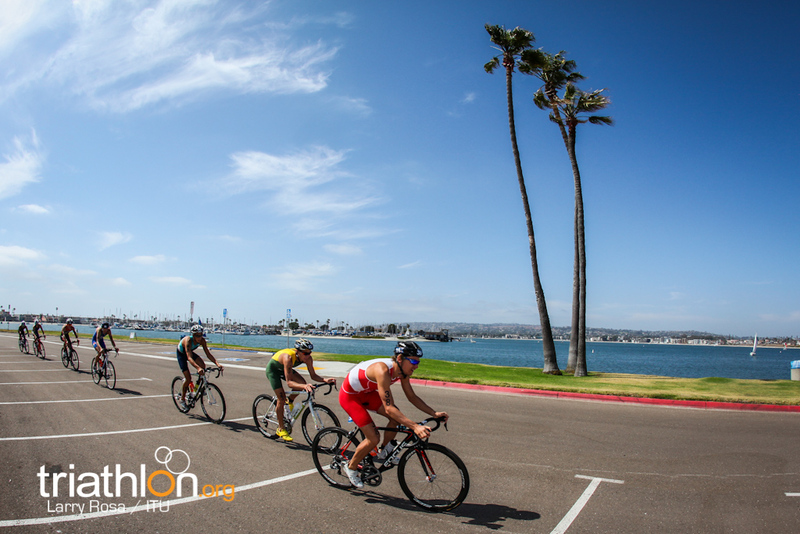 Leaving T2, the front group had a lead of 2 minutes and 30 seconds on the rest and while it was clear that the podium places would come from that lead group of eight, the outcome was far from decided. 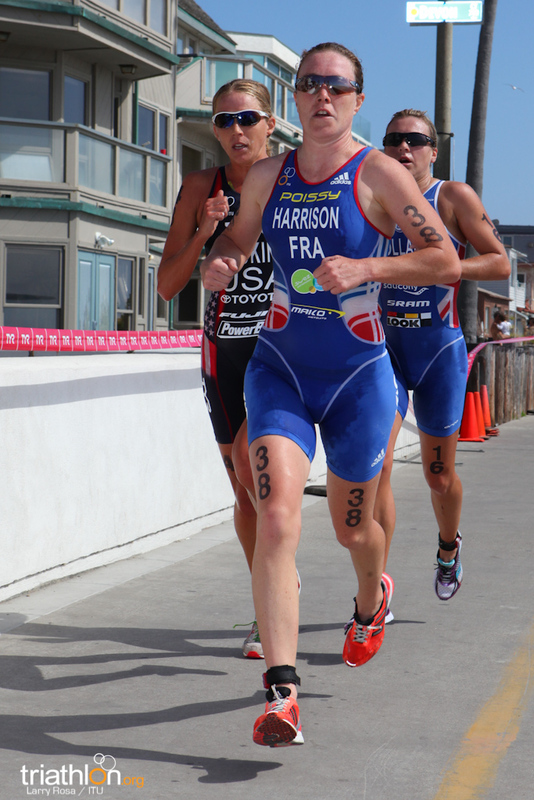 At first, Jenkins, Holland and Bennett moved ahead in a frenetic first lap, but then Haskins bridged up. 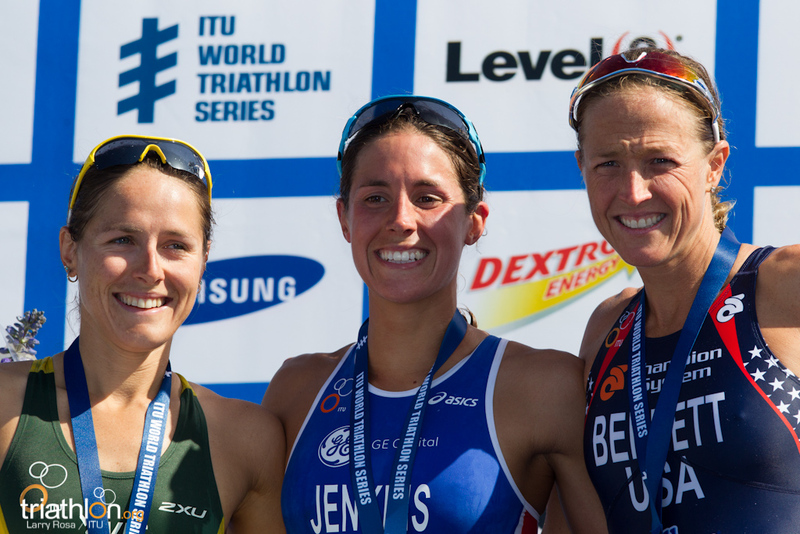 Halfway through, it looked like a battle between Jenkins, Densham, Haskins and Bennett. 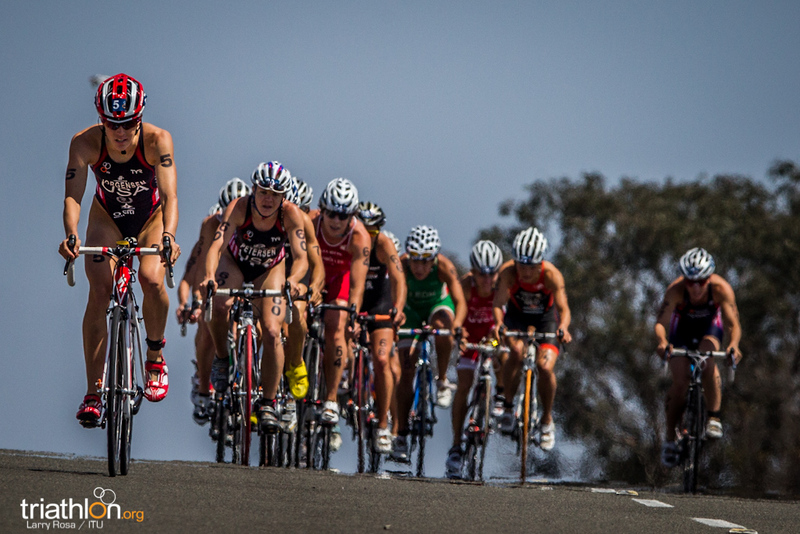 Haskins then dropped off, and Densham and Jenkins pulled off the front to engage in their own battle. 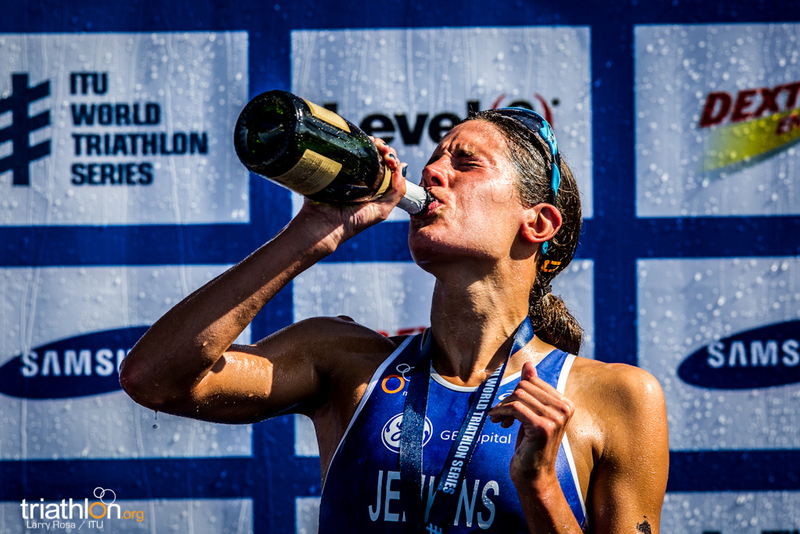 Jenkins’ run split was the fastest of the day, at 33 minutes and 34 seconds, to take a commanding victory, ahead of Densham. 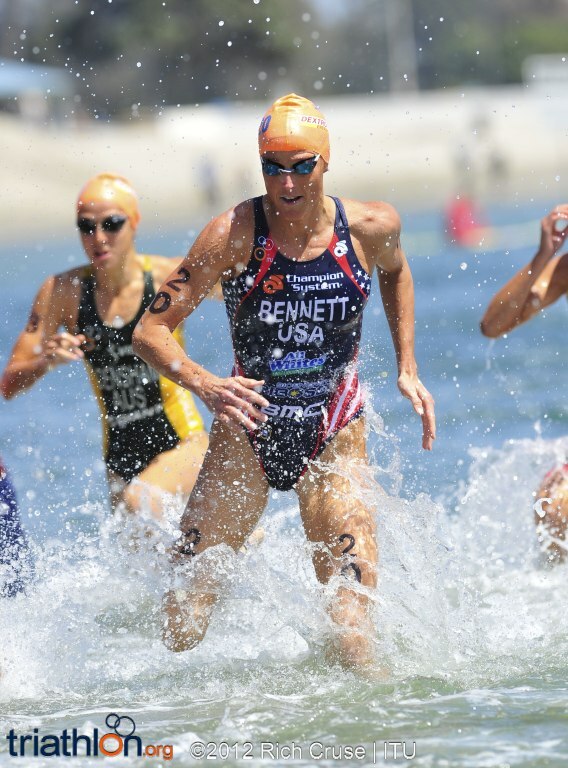 Bennett held on for third, but only just staved off a late charge from Harrison who completed an incredible last lap to finish fourth. 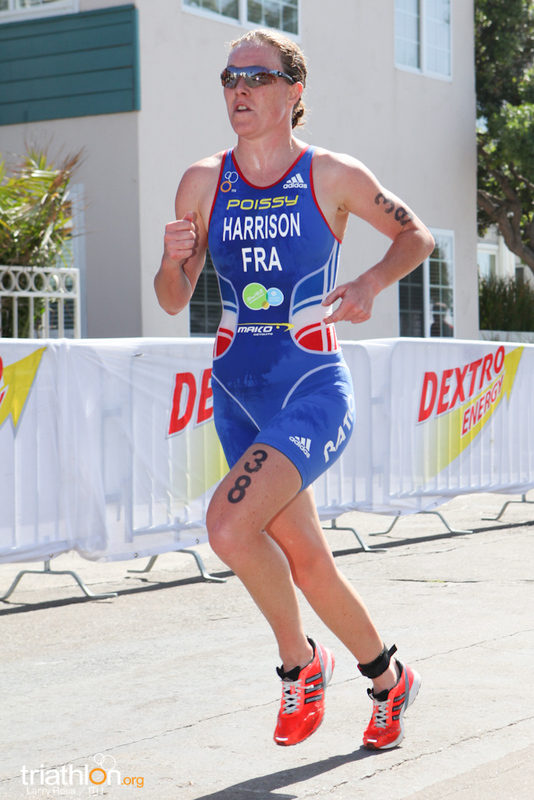 Holland’s fifth place will mean plenty for her own Olympic selection, as only Jenkins is currently on the British Olympic team for the women, while Bermuda’s Flora Duffy confirmed her place in London and kept up her incredible form just one week after taking her first World Cup win in Huatulco. 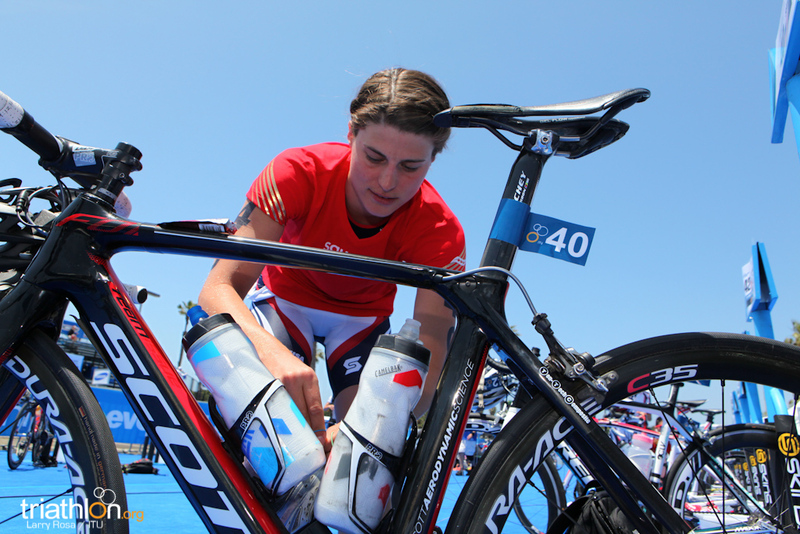 Germany’s Anne Haug completed the second fastest run of the day - her and Jenkins were the only two women to run under 34 minutes - to finish seventh. 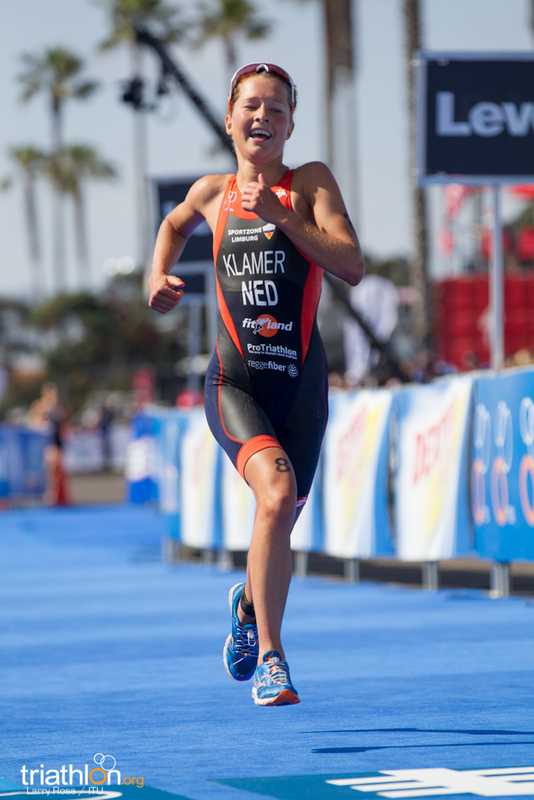 While she is still Germany’s fourth women on the Olympic rankings list, it was a boost for her own selection chances as so far only Anja Dittmer has been selected. 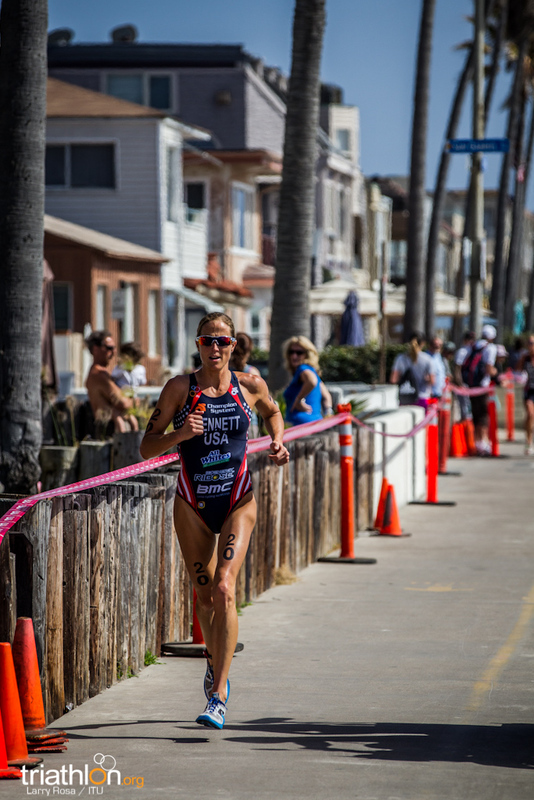 It also makes it tough for Switzerland to now qualify three spots for London, as Haug is on the verge of overtaking Daniela Ryf - who failed to finish in San Diego. 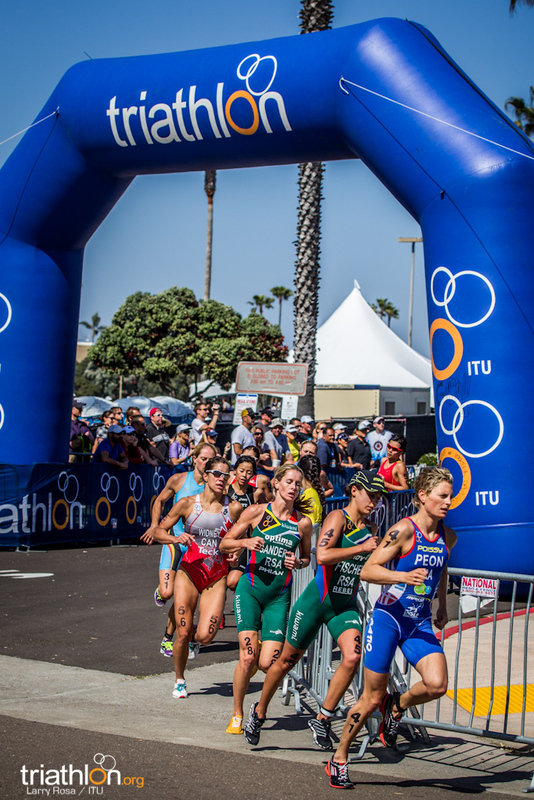 A total of 12 women didn’t finish in a tough race, including Lisa Mensink, Debbie Tanner and Kathy Tremblay who withdrew after a crash leaving T1. 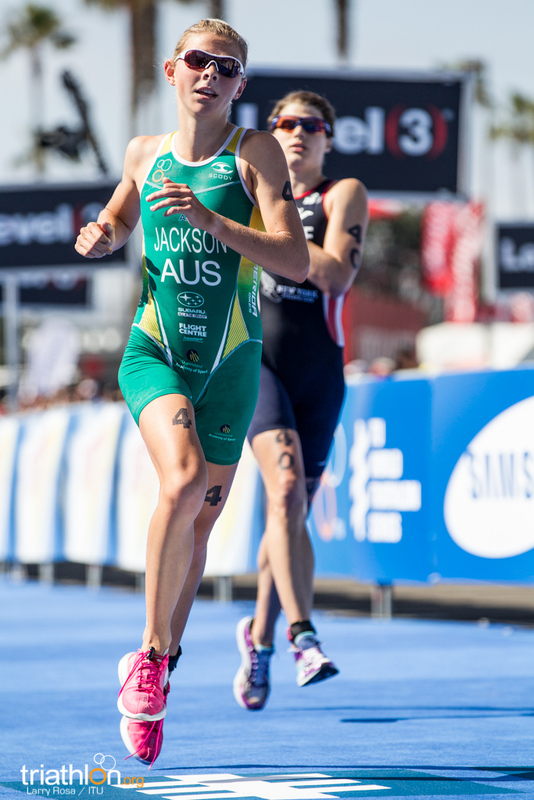 Haskins finished up in eighth place while Moffatt and Gentle rounded out the top ten, making it three Aussies in the top ten. 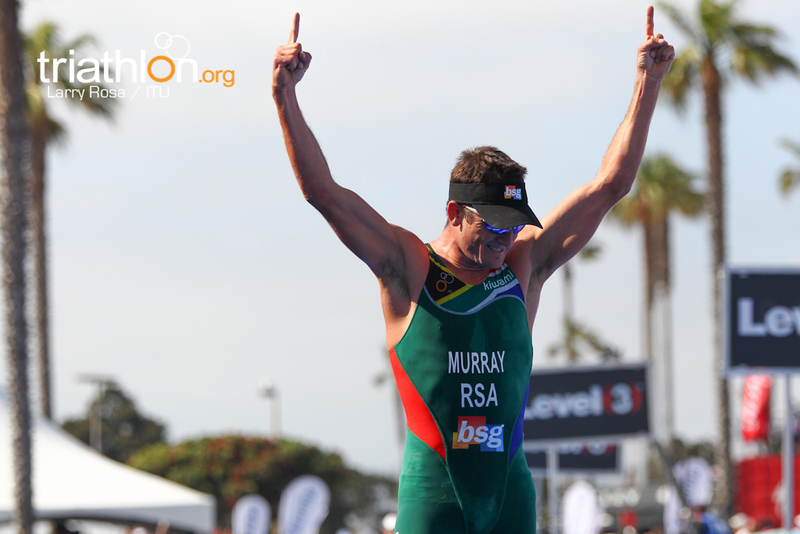 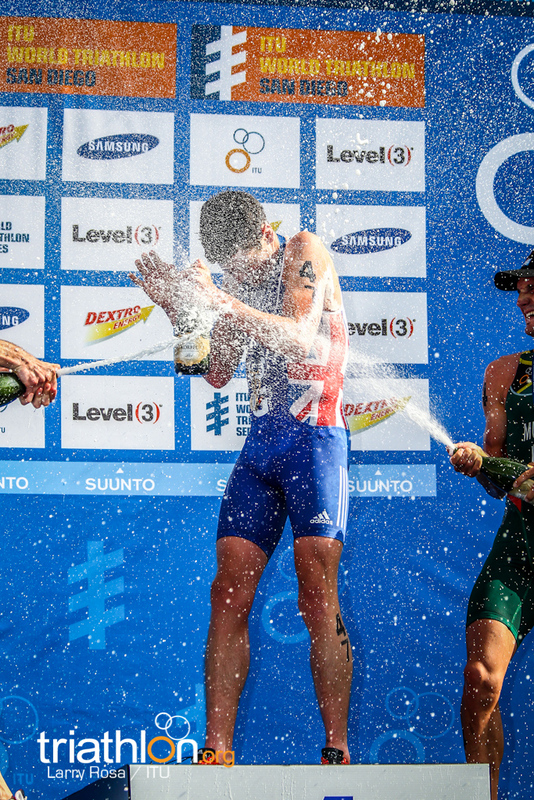 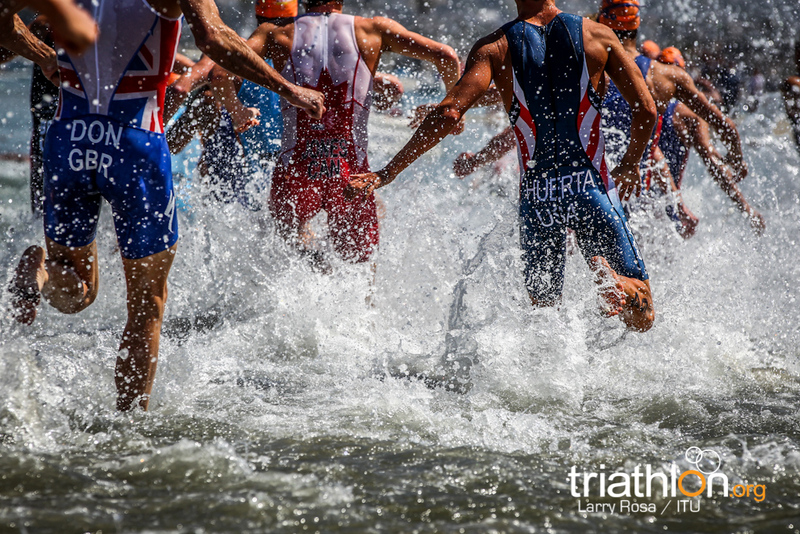 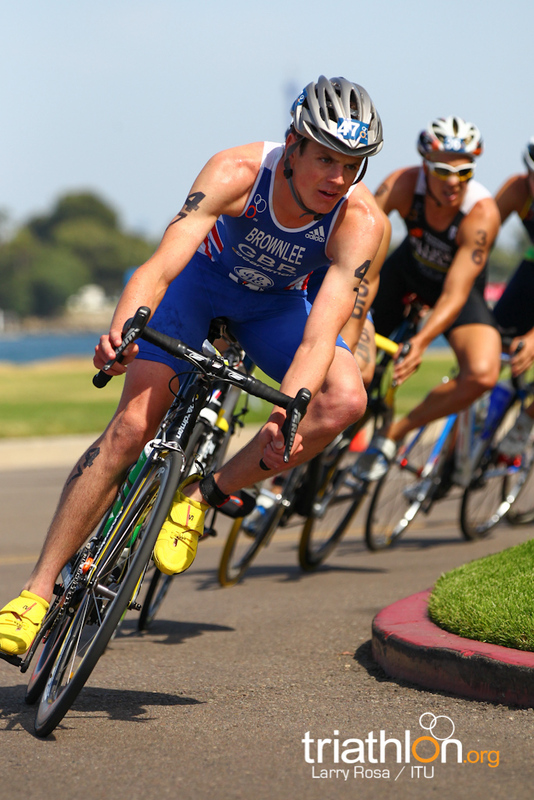 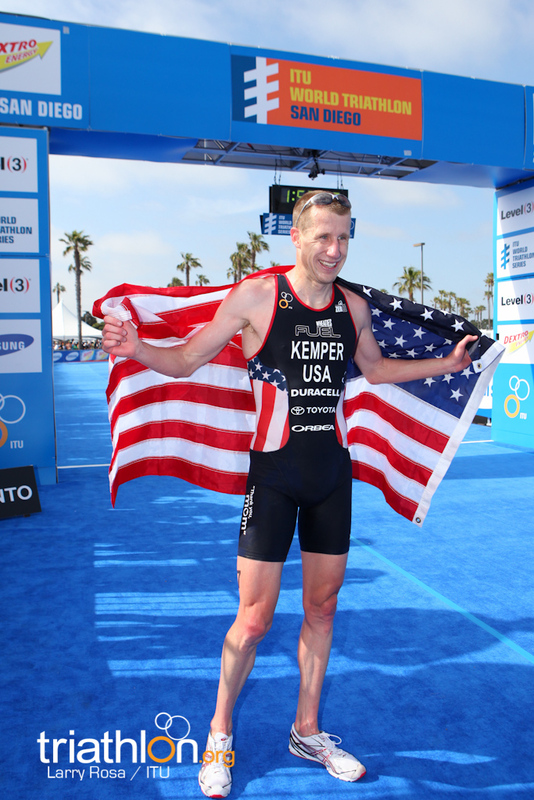 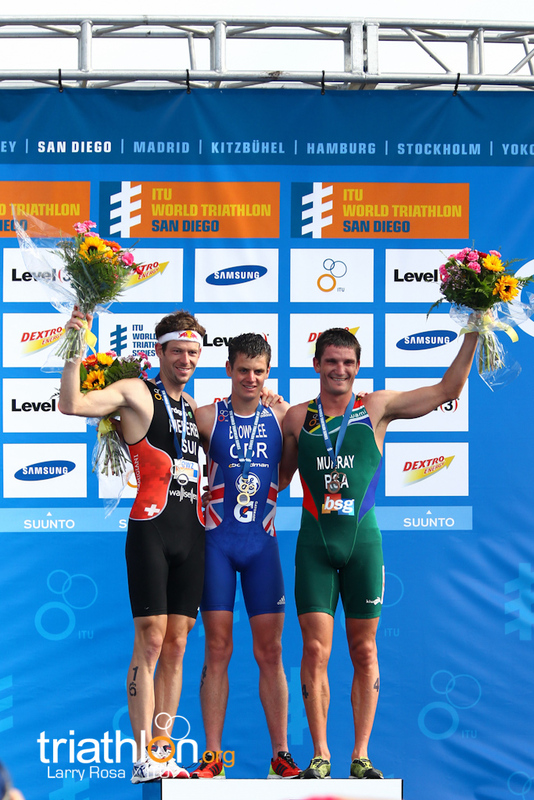 Great Britain’s Jonathan Brownlee kicked off his Olympic season with a dominant performance in San Diego, winning his second ITU World Triathlon Series title ahead of Switzerland’s Sven Riederer and South Africa’s Richard Murray.